Sta nevicando in Durango Mountain Resort ?Grazie! They've renamed it Durango Mountain Resort but it will forever be called Purgatory by locals and long time visitors. 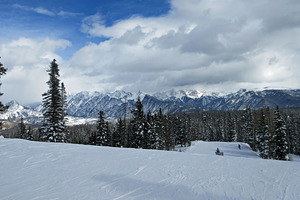 Huge peaks surround Durango Mountain Resort (Purgatory) on three sides, and the high desert country borders the resort to the south. Two weather systems brush against each other, creating (normally) fine ski weather with plenty of light snowfalls, followed by sunny days. There is a shuttle service from the town of Durango to the resort. The Paradise Freestyle Arena, half pipe (creation of the DMR Freeride Team), 2 Bombadier snow cats and replacement of kid's rental fleet were added in 2003-04. The Best Western Lodge at Durango Mountain Resort (Purgatory) is just north of the entrance to the resort and offers studios to 2 bedrooms. Elk Point offers lodging at the base of the mountain with garage parking. Luxury lodging exists in Purgatory Village Condominium Hotel and East Rim Condominiums, just 30 minutes away. On the San Juan Family Adventure kids ski free. Sneak away for the weekend with the Rocky Mountain Highway Getaway; one night slope side lodging at Durango Mountain Resort (Purgatory) and two day lift tickets for a reasonable price. 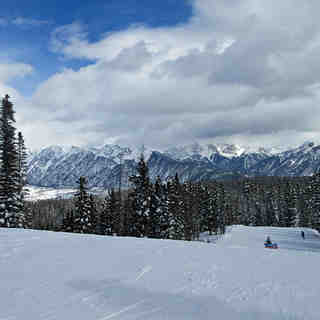 Durango Mountain Resort is a very family friendly ski resort. While not particularly big, there's a nice mix of terrain that can accommodate all levels of skiers. My kids love it because it offers top to bottom beginner terrain with room to manuevre. I love it because of some excellent blue cruisers (Dead Spike, for example) and even some challenging expert terrain on the north end of the resort. It also happens to be a fairly easy 3 hour drive (weather permitting) from Albuquerque, NM, the closest airport with non-stops from many cities. Colorado Springs or Denver are more like a 7 hour drive. It is definitely more low key than the premier resorts in Colorado and that is one of the things I like about it. The resort does have a new lodge & there are plans for future expansion to bring it more up to par with some of the other area resorts. It is about 20 minutes or so north of town with incredible views of the Needles ranges & the San Juan mountains. There are also plenty of lodging options on or around the mountain & the town of Durango is one of my favorite mountain towns. A ride on the Druango & Silverton Narrow Gauge Railroad or a meal at Steamworks (excellent brew pub) are Must Do's in town.